WEST LAFAYETTE, Ind. - A Purdue University study found an agricultural herbicide alters reproductive and neuroendocrine genes during embryonic development in fish, a finding that will help establish a genetic profile to determine atrazine's specific effects. 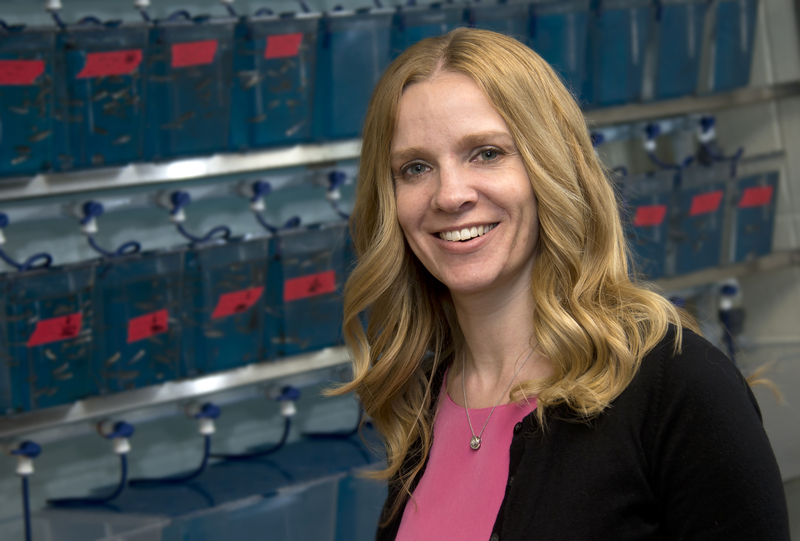 "The exact connection to health outcomes is not defined, but we found gene alterations in our animal model when exposed to the level of atrazine that is deemed safe for drinking water," said Jennifer Freeman, an assistant professor of toxicology in the School of Health Sciences. "Also of concern was an increase in head length in the study's young zebrafish when exposed to low doses of this widely used herbicide." The federally approved amount of atrazine is 3 parts per billion in drinking water. The amount is currently under review by the Environmental Protection Agency because the herbicide is considered an endocrine disrupting chemical and potential carcinogen. While atrazine is confirmed by many animal studies as harmful to endocrine systems, its specific effects are still unknown, Freeman said. Atrazine is used to kill broadleaf and grassy weeds in crops, such as corn, especially in the Midwest. The chemical is sometimes used on residential lawns in the Southeast. This study, partially funded by the National Institutes of Health and published by Toxicological Sciences journal, focused on exact gene changes. The researchers tested atrazine at three levels, 0.3 ppb, 3 ppb and 30 ppb, by exposing developing zebrafish embryos. The 3 ppb level is the current safe level in drinking water, and the larger amount of atrazine tested represents what a worker may be exposed to or may be present in surface water. By using the zebrafish model the researchers were able to focus on the 72-hour embryonic development time, which mirrors human prenatal development. The researchers started by evaluating the more than 35,000 genes in the zebrafish's genome. They found that two genes, CYP17A1 and SAMHD1, were changed in all three treatments. CYP17A1 plays a role in biosynthesis of steroid hormones and the conversion of androgens to estrogen, and SAMHD1 controls immune function. Also of concern was that 42 of the genes, including CYP17A1 and SAMHD1, were affected in the 30 ppb treatments as well as in the 3 ppb treatment. The LH gene, which produces the hormone that triggers ovulation, is another example of an affected gene at both 3 ppb and 30 ppb treatment levels. "There is a connection between the current legal level of atrazine and higher concentrations that need further study," Freeman said. "Specifically, we need to focus on the 3 ppb level to determine if it is safe or if these changes play a role in adverse health effects." The affected genes in this study correlate with findings in other studies, but Freeman and her team also identified a number of novel genes that are linked with functions previously associated with atrazine toxicity but for which genetic targets are not yet known. "Identification is just the beginning," Freeman said. "The goal is to understand the genetic pathways and how they are altered to see what's happening in the big picture." Another difference in the Purdue study was the increase in head length of the exposed zebrafish. "This was a subtle change for the fish larva at all exposure levels that we were able to see with finer measurements but not with the eye alone," Freeman said. "This morphological change in the zebrafish indicates that low levels of atrazine can stimulate development and alter the physiology of exposed individuals." The researchers also will be looking at the long-term effects of the fish exposed to these three atrazine levels as they grow and reproduce to link the developmental gene changes to adverse health outcomes. The EPA, working with the Federal Insecticide, Fungicide and Rodenticide Act Scientific Advisory Panel, continues to evaluate scientific research regarding a potential link between atrazine and cancer in humans. According to the EPA website, "Even though the panel agreed with EPA that the epidemiologic evidence does not strongly suggest a link between atrazine and cancer, the panel did not agree that a lack of strong evidence justifies a conclusion that atrazine is not likely to be a human carcinogen." Freeman said continuing to investigate changes in genes associated with cancer is critical because there needs to be more information before determining if atrazine is a human carcinogen. "In our study, a number of gene changes were associated with cancer pathways, too, and while related gene pathways for cancer are involved, we are not saying atrazine causes cancer," she said. "We know these genes are changing in some way, and we need to do further targeted mechanistic studies to determine if there is a connection." The grants from the National Institutes of Health's National Center for Research Resources and National Institute of Environmental Health Sciences supporting this work are shared between Freeman and Maria Sepúlveda, an associate professor of forestry and natural resources. Gregory Weber, a doctoral student in health sciences, is the paper's lead author. Other authors are Samuel Peterson, a former health sciences graduate student, and Solange Lewis, a former postdoctoral researcher in forestry and natural resources. Atrazine, a herbicide commonly applied to agricultural areas and a common contaminant of potable water supplies, is implicated as an endocrine disrupting chemical (EDC) and potential carcinogen. Studies show that EDCs can cause irreversible changes in tissue formation, decreased reproductive potential, obesity and cancer. The U.S. Environmental Protection Agency considers an atrazine concentration of ≤ 3 ppb in drinking water safe for consumption. The specific adverse human health effects associated with a developmental atrazine exposure and the underlying genetic mechanisms of these effects are not well defined. In this study, zebrafish embryos were exposed to a range of atrazine concentrations to establish toxicity. Morphological, transcriptomic and protein alterations were then assessed at 72 hours post fertilization (hpf) following developmental atrazine exposure at 0, 0.3, 3 or 30 ppb. A significant increase in head length was observed in all three atrazine treatments. Transcriptomic profiles revealed 21, 62 and 64 genes with altered expression in the 0.3, 3 and 30 ppb atrazine treatments, respectively. Altered genes were associated with neuroendocrine and reproductive system development, function and disease; cell cycle control; and carcinogenesis. There was a significant overlap (42 genes) between the 3 and 30 ppb differentially expressed gene lists with two of these genes (CYP17A1 and SAMHD1) present in all three atrazine treatments. Increased transcript levels were translated to significant up-regulation in protein expression. Overall this study identifies genetic and molecular targets altered in response to a developmental atrazine exposure to further define the biological pathways and mechanisms of toxicity.